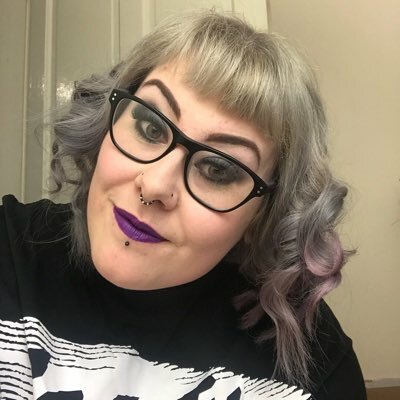 Have you got any new Pops? I may have purchased a 'few' more since my last post! Collecting these has become a new obsession of mine, I guess it's Funko's fault for bring out new Pops every week that have been of major interest to me for example, American Horror Story. To start since my last Funko post I have been spending a lot more time in Manchester due to being at University so I'm close to Forbidden Planet and have taken a few trips over the past weeks. A couple of weeks ago I made an online order from Hot Topic since they had a 50% off international shipping deal on. 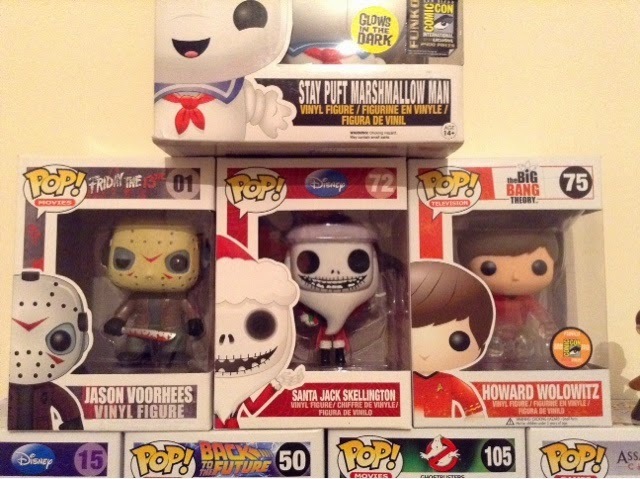 The monthly subscription boxes for October have included some Pops as well. Overall between me and the boyfriend we have gained 11 new Pops ... Oops! We now have a Funko tower!! Instead of me taking the tower down I have taken the images in groups and not in order of purchase. 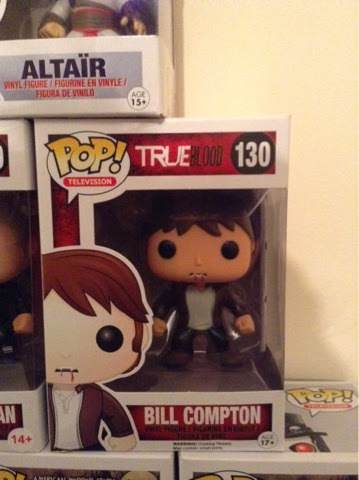 First all I finally managed to get my hands on Bill Crompton well the Pop of him anyway haha. Funky Figures in Wigan posted that they had some stock delivered so they saved me one and I went for it the next day. Great service just like normal. Price was £10.00. As I said above I did an order from Hot Topic in America. They often have a deal on to get 50% off international shipping and there is Hot Topic exclusive Pops so I took advantage of the offer and ordered 2 exclusive American Horror Story:Coven pops. Flona Goode blood splattered and Cordelia Foxx with no eyes. Both priced at $10.00 each and shipping was reduced to $23-25.00 so all together in pounds it was £26.00. Which for exclusives is a good price, £13.00 each. A little note though I had to ring Hot Topic in America to confirm my order but I've recently been told that if I had used a credit card to pay I wouldn't of had to do this. Phone call cost me £2.80 from a 3 contract so not too bad. 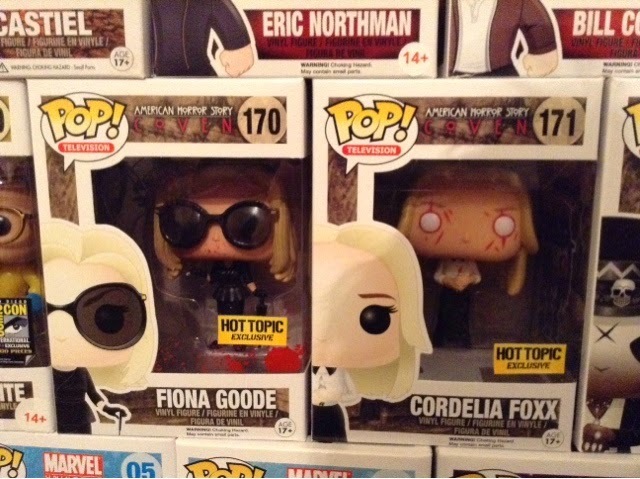 Fiona Goode is now my favourite pop, she's got so much detail on her and came with a little stand (not that I will be taking her out the box). 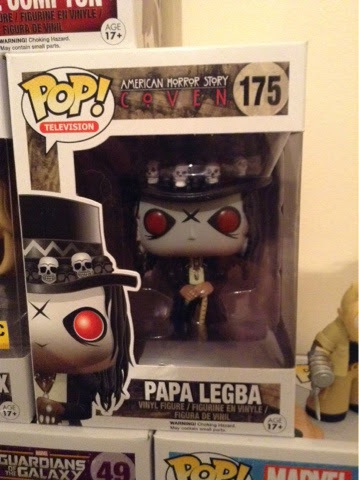 To add to the AHS:Coven pops I managed to get Papa Legba from FPi in Manchester after waiting weeks for them to come in store. He was priced at £9.99. Very detailed just like Flona too. On another visit to FPi M'cr I came across a Santa Jack Skellington which I was surprised at, as I'd only seen him on eBay for around £40.00+ so I grabbed him at only £9.99. On the same trip I also found an exclusive Howard Wolowitz from San Diego Comic Con 2013 this was also priced at just £9.99 so I snapped him up too. This month's GeekBox was Nightmare themed and included a Jason Voorhees pop, I was chuffed about it even though it was the boyfriends box, I've sort of claimed this pop as he's not that into horror movies. 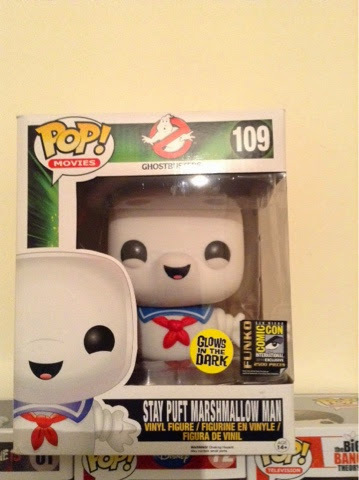 As you can probably see in the above image there's a bigger sized pop a Stay Puff Marshmallow Man, this was the boyfriends birthday present from me, it's a San Diego comic con exclusive 2014 and it glows in the dark. 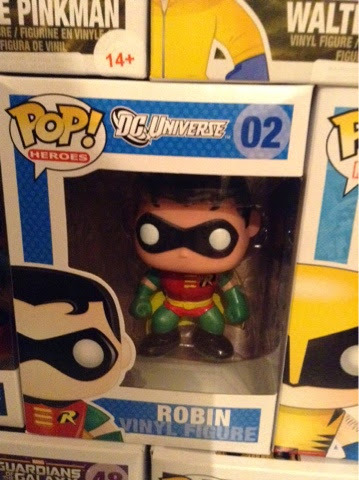 I won't say how much this pop was as it was a present but I got it from FPi in M'cr. 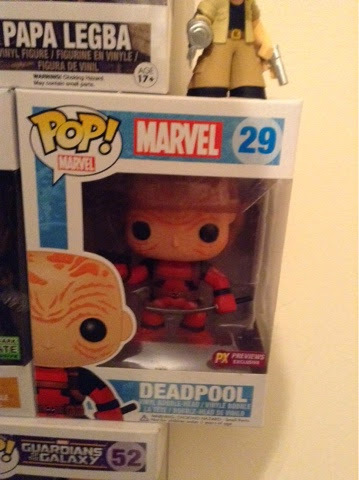 Also adding to the boyfriends part of the collection is an Unmasked Deadpool Px exclusive that came with this month's Nerd Block. I personally think the detail on the face is amazing it's pretty good getting exclusives from a subcription box too. 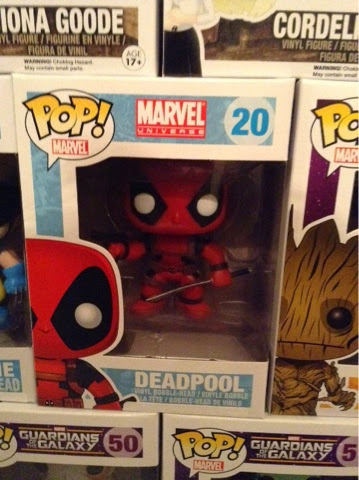 A week before receiving this unmasked Deadpool he had ordered a normal variant Deadpool with Funky Figs so that came in stock. Priced at £10.00. Funky figs have been putting together mystery boxes with different themes, Ghostbusters was the 1st one they did, I got one of those but he also put together a DC themed box which Dean (boyfriend) went and brought, inside he got a Robin pop. Lastly we have received a few Funko mystery minis, one in last month's Loot Crate and another in last month's GeekBox. We also brought one from HMV Liverpool for £5.00. So that's an update on the Funko collection, I still have pre orders that haven't been released yet; Winged Castiel + Charlie expected ship date is 31st October, Dancing Groot, Professor X, Magneto, Harley Quinn and Poison Ivy are all on pre order with Funky figs. 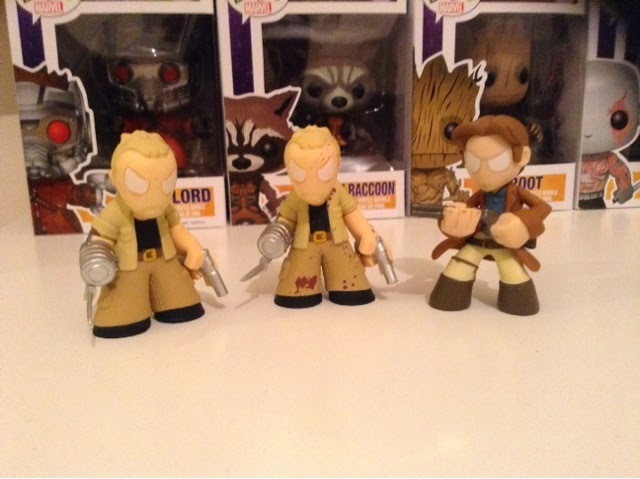 I am hoping Dancing Groot arrives next month. Also the new Crow pop that was released not long ago, I have pre ordered that with Funky figs too expected December I think. I am going to try and not buy any more except for my pre orders since it's coming up to Christmas I need to buy presents so il update you when my pre orders come in or if we get any in our sub boxes. Ketchup PS Funko Zombies wanted!